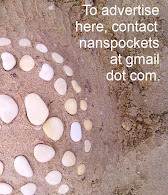 Most people who have heard of Bunty O'Connor of Ajoupa Pottery know about her art. 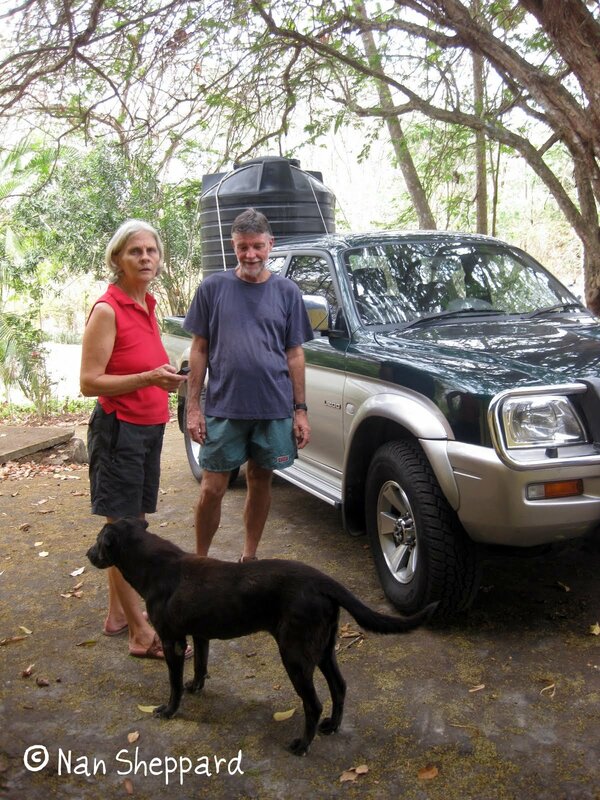 But in recent years, Bunty has been campaigning for protection of the forests of Trinidad, with able-bodied assistance from husband Rory and permaculturists like Johnny Stollmeyer and Erle Noronha. 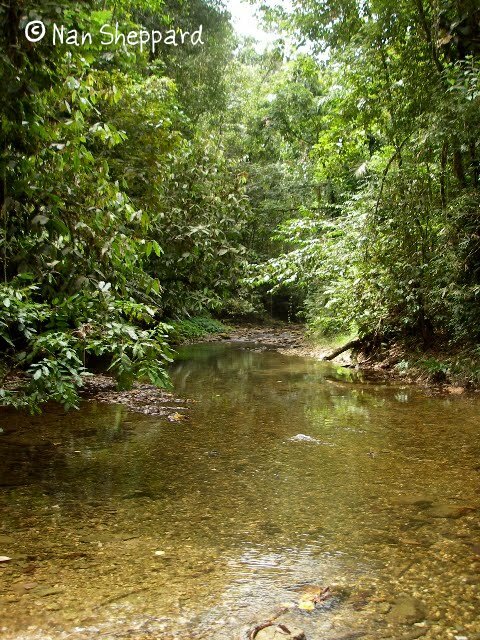 The 'Ajoupa' estate in central Trinidad is home to hundreds of seedlings of the rare and the endemic trees of the region, along with our popular fruit and wood trees. Rearing the seedlings is hard work: The local water authority does not pipe water to many rural areas in Trinidad, so during the rainy season the residents collect rain water, and during the dry season (from January to May) they use trucks with tanks. A hired truck can cost US$100, too much for most residents, but the area is officially agricultural so water collection efforts can become desperate. 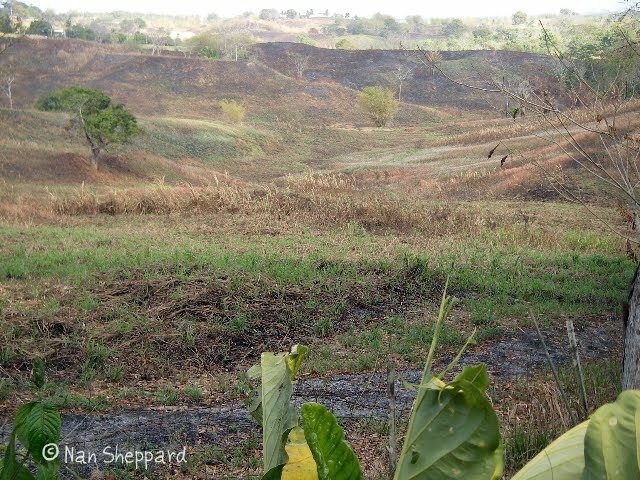 The bare lands of Central Trinidad, once under forest, cleared for sugar and now baked hard by fire and sun. A river used to run in the valley between the hills. This landscape is extremely difficult to repair and will require daily vigilance in the dry season over many years to prevent illegal burning if it is to be restored. Everyone would agree that Trinidad is a very small island, only 40 miles by 50 miles and supporting a population of a million and a half inhabitants, billions if we include the birds, insects, beasts and reptiles. This makes it easy to despoil and we have been burning, hacking, littering and quarrying as if tomorrow would never come. Over the past 50 years, there have been warnings a-plenty from our own biologists and ecologists about the effect of fire on our hillsides and lowlands, mining and quarrying and destruction of forested lands. Denuding the hills has resulted in our streams drying up - take a drive to Asa Wright and see how the hundreds of "leaks" in the mountain side have disappeared. 2010 has arrived with a vengeance, bringing our first sampling of what happens when we ignore the earth we live on and do nothing to repair it. Global warming is blamed for our present situation of drought and intense daytime temperatures are caused, we are told, by the "burning of fossil fuel". We are somehow left with the impression that this evil is carried out by "industrialized nations" somewhere out there. Intellectuals pontificate and leave us feeling that there is nothing we can do to help the situation. Trees do any number of useful things. They provide shade in the dry season, providing they are the right sort of tree. Have you ever wondered why the grass is always greener and the air cooler where there is shade? 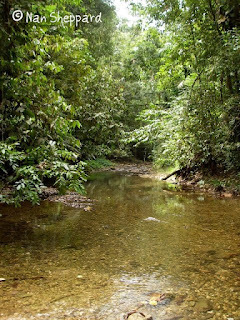 In Trinidad, we have lots of trees to choose from - over 300 different species that grow here naturally. Roots of trees dive deeply down into the earth, holding it up in areas prone to landslide, allowing rain to percolate deep down to replenish water supplies. Roots die too and are replaced on an ongoing basis. Their remains and the leaf litter that accumulates, provide nourishment for organisms that build up the soil. Roots of some trees, like the immortelle and the pois doux, harbour bacteria which make their own fertilizer and share with the surrounding plant community as is seen in a cocoa plantation. A tree is not a creature that remains static; its pattern of growth is slower than ours and it may require 3 or more human generations to care for the same tree, so we need to look upon our living trees as savings or money in the bank. Scientists have recently declared that trees give off chemicals that create rainclouds. Giants of the rainforest create their own rainfall patterns by transpiration and the interaction of leaves and insects. If this is so, then we should be planting hundreds of groves of trees to win some of this holy water. Trees absorb pollution and they give off oxygen. The atmosphere in which our brains evolved held more oxygen than it does today, so perhaps this is why we are suffering from the ignorance and inertia that prevents us from getting out and repairing our communities and countryside. The outlook is dismal, no water, no rain, no shade, no trees and to make it worse no action. Trees and water go together; trees circulate water up and down their trunks and branches. They transpire water vapour through their leaves into the atmosphere which has the effect of cooling the surrounding air. Water shortages will become more and more critical until we begin to understand the relationship between forests and water. A recent project being carried out in south Trinidad promises to be a successful example of collaboration between teachers, children, big business and agriculture. Funded by one of our multinationals, the project educates primary and secondary schoolchildren about the importance of permaculture or agro forestry. The children collect their own seeds and germinate them at school. When they are big enough, the plants are sold or exchanged with other schools for planting. Because of the diversity of environments where these schools are located, there is a tremendous variety of trees, shrubs and herbs to collect. The students are also expected to research their finds and keep a record. After planting, which is done at the beginning of the rainy season, the stem of the plant is protected from the weedwackers with split PVC pipe, the trees are watered and maintained and a note is keep in a small record book. 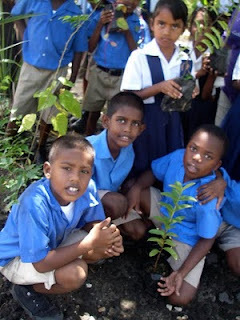 It is hard work and everyone gets such enjoyment from the day spent planting and watering, that one cannot imagine why children all over the island can't do the same, especially as so many schools stand in bare tracts of land with only a lonely neem or manila palm tree. Orchards of "old fashioned" fruits have been established in some of these schools, and playgrounds surrounded with shade trees. Maintenance is an issue but the children know that they have to look after their trees. How educational is this? The children learn about the earth they live on, observe and collect her bounty and then proceed to grow something essential to their own health, wealth and happiness. Every boy and girl plants a tree or three! The dry season is the time of year when trees make seed pods and fruit. Why not go out and collect some? Go to the market and find fruit that is on sale: sapodilla, sugar apple, chenette, guava, cashew, coconut, cherry, chataigne, pommerac, paw paw and mango. Look for poui and immortelle seeds drifting down on the breeze. Get some plastic containers. Cut off the tops, punch them full of holes at the bottom, put some soil in them, place them in a cool shady spot, put your seeds into the soil and water them. Soon you should be rewarded with nice healthy trees. Grow the trees on, show them to your neighbours, and talk about what you are doing. Don't be disappointed by scornful remarks. Tell everyone you are saving T & T. Get the children to help. It will be a struggle to change people's minds and habits, but persevere. Ask them for help in planting your tree around the recreation field. You will be the flag bearer for the new Green movement because ordinary people are at the foundation of the remedy to restore shade and balance to our communities. Those who hack, burn and bulldoze are the criminals who threaten the rights of all of us to enjoy the beauty of nature, to be able to shelter from the sun, smell the flowers, and pick fruit and above all to breathe clean air. The riverside before cutting and burning. These areas need to be preserved for their water and restoration of our well being. But it's $600.00 TT or US$100.00 for the truck! Got bucket-a-drop last night and early this morning, 130 mm (about 4.75") in the guage this morning. Flying to Tobago in a couple hours, so I nope it is not too bumpy! I have had the privilege and honor to not only meet Rory and Bunty, but to see part of the 'Ajoupa Estate'. My most vivid memory is seeing the brightly colored parrots (Macaws?) flying through the trees. They are amazing. 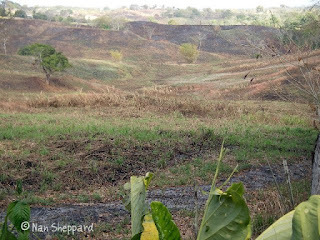 Trinidad, in its natural state, is SO beautiful - it's a shame to even think about vistas like the one pictured - bare valley that was once forested and green, a river gone to dust. I loved my time there. Seeing the destruction - just hurts. I just can't understand the way certain people can just cut down a living tree so easily--without any respect or appreciation. And the need for trees is even greater if the statistics I got from our water company regarding average water usage is correct. Their data states that the average UK household of 2 uses 332 litres of water a day!! So if my calculations are correct, to store water for a 6 month period (essential for those who do not get pipe born water and have to sit out the dry months) an estimated amount at 119,500 litres of rain would have to fall!! Of course storing this vast amount of water would be nothing less than a small reservoir. And so I guess... piped water to ALL houses is also a great need! When broken down like this. I can now see why the Romans were so particular about building such wonderful aqueducts.... anyway that is another story. The main issue is... Plant Trees... look after the forests we have!! Otherwise there will be no water at all! Thanks to you for posting this article and thanks to Bunty and Rory for all they do. Knowing our daughter, her husband and our grandchildren live in Trinidad makes it all the more vital that this message be heeded. Makes me think of how the Irish had relationships with their trees and the ancient wisdom that shows. 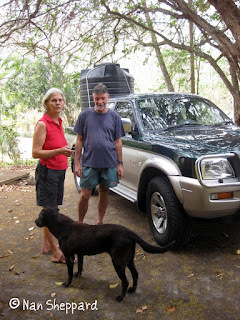 We collected our rainwater in Antigua, as mandated for all homeowners, and used only it for the 2 1/2 years we were there. They've been doing that for years now and fit every home with gutter collectors.